NEW! - Now mix with mixing ball for fast mixing! Goldlack (P) is a polishable gold surrogate preparation based on stabilized bronze powder, Orasol and acrylic synthetic resin. 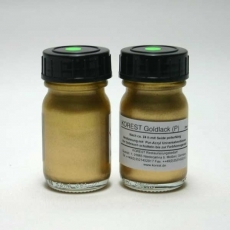 The Gold Laquer is applied on a smooth, coated with acrylic synthetic resin, replenishment. The level of shine can be confirmed after 12 to 24 hours by polish by hand with a silk scarf. A further application of acrylic synthetic resin is not necessary. Under convenient circumstances a shiny gold effect can be reached. By addition of matte polish - Mattierungsmittel - a matte bronze on supplement of biscuitware can be imitated. For this the "Goldlack (P)"-application will be brushed softly after drying with a bristle brush. 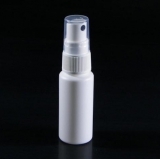 Before use please shake until the bottle has an even shade and the included mixing balls let you hear a clear clicking. As a dilution a Pur-Acryl-Dilution is suitable. Mass as a Slip Engobe or modeling paste for porous ceramics. The gold lacquer adheres to all dry, clean, grease-free, smooth or porous surfaces - gloss similar to gold leaf. Compared to conventional similar products it is distinguished by its special gloss, which remains largely intact even after being coated with a transparent protective coating.